Abusing prescription opioid pain relievers is a major problem among young people, and a new study shows users are combining those drugs with other substances. In data from the annual Monitoring the Future survey for the years 2002-2006, 1 out of 8 high school seniors reported having used prescription opioids nonmedically; 7 out of 10 nonmedical users reported combining prescription opioids with at least one other substance in the past year. Marijuana and alcohol were the most common (58.5% and 52.1%, respectively), followed by cocaine, tranquilizers, and amphetamines (10.6%, 10.3%, and 9.5%). Teens who mix prescription opioids with other drugs are four times as likely as non-users to report frequently getting drunk and are eight times as likely to be marijuana users. Twenty-four percent of teens who take prescription opioids nonmedically say they usually or always combine it with marijuana. Opioids are dangerous when taken other than as prescribed, and combining with other drugs compounds the risks. The new research findings highlight the importance of addressing combined drug use in interventions to prevent substance abuse in young people. 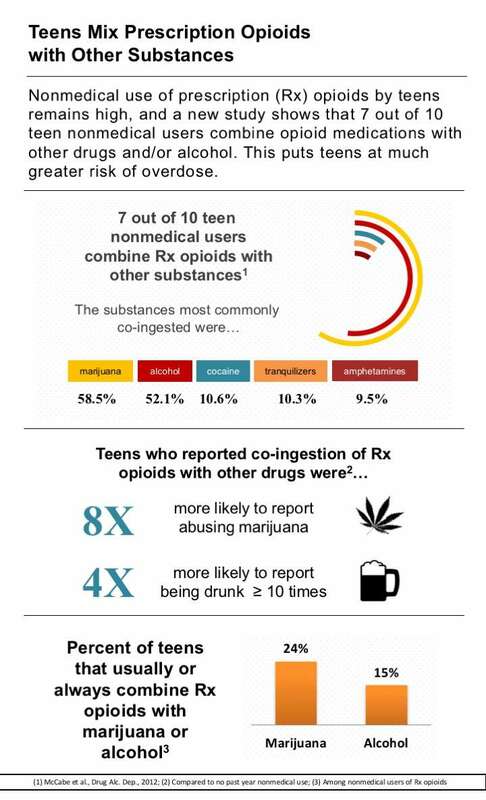 Top Graph: Seven out of ten teen nonmedical users combine opioids with other substances. Past year frequency of co-ingestion of prescription opioids and other drugs among nonmedical users of prescription opioids. Co-ingestion with marijuana was reported by 58.5%, with alcohol by 52.1%, with cocaine by 10.6%, with tranquilizers by 10.3%, and with amphetamines by 9.5% of teens. Bottom Graph: Bar chart showing percent of teens that usually or always combine Rx opioids with marijuana (24 percent) or alcohol (15 percent).